Thousands of motorists nationwide are filling up with illegal fuel, according to Revenue and Customs. Customs officers have carried out spot checks at petrol stations, supermarkets and car parks to catch motorists using reduced-duty fuels. In some areas one in five tanks in vehicles stopped were found to contain red diesel, an agricultural fuel only intended for off-road farming vehicles. 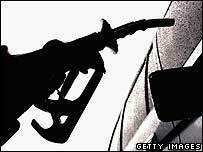 Red diesel only costs about 35p a litre - about 65p less than ordinary fuels. So far this year, more than 1,700 private cars have been found running on the illegal fuel. Red diesel works in the same way as normal diesel but, because it is taxed at a lower rate, it is only to be used in agricultural vehicles. It is chemically marked with a red dye to make it more identifiable. With normal diesel prices soaring, Revenue and Customs fear that drivers using the fuel illegally are costing UK taxpayers £350m each year. A Revenue and Customs spokeswoman said: "Using red diesel may seem an attractive option, but the price difference is there for a reason. "People who use the illegal fuel are abusing the tax system. They cheat the whole country out of vital funds for public services." The spokeswoman explained that a scale of penalty charges is in place to punish those who use illegal fuels. For example, she said a person who used £27 of red diesel could be charged a £500 penalty.